On Wednesday we celebrated 1 month in Pearl Lagoon! It’s amazing how much has happened over the past 4 weeks. There have been ups and downs, challenges and disappointments, and several lessons learned. This past week has been one of our busiest since arriving in Pearl Lagoon. Last Wednesday, Miriam (Pueblito’s Program Director) arrived in Pearl Lagoon for the North-South Dialogue. The Dialogue brought together 4 Canadian teachers and 13 Nicaraguan teachers from Pearl Lagoon and its surrounding indigenous communities (Orinoco, Kakabila, Awas, Raitipura and Halover). 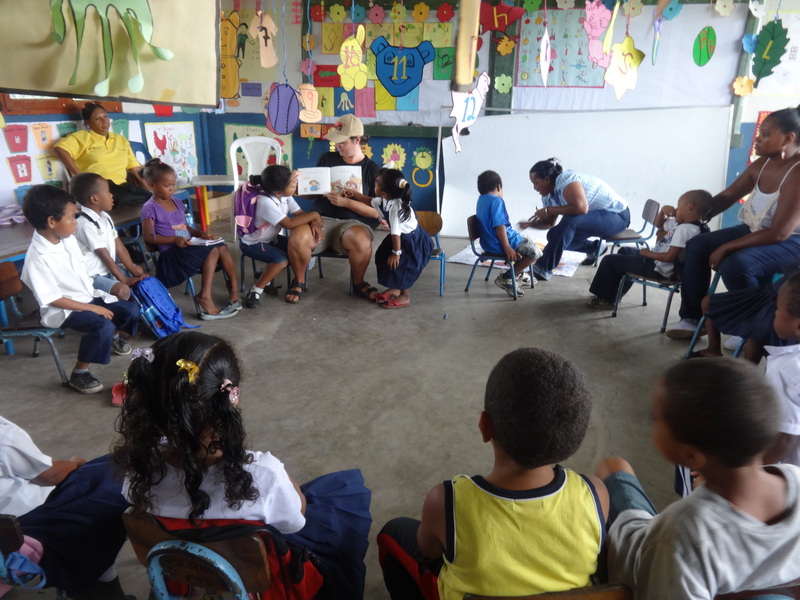 The purpose of the dialogue was to bring together Canadian and Nicaraguan teachers for a mutually beneficial cultural and educational exchange. The teachers participated in discussions about the purpose of education, lesson and workshop planning and classroom visits. Despite coming from different regions, it became evident that there are common challenges and successes in the classroom. All teachers experienced challenges of respect and how to keep students engaged in learning. The teachers were so dedicated to trying to figure out how to help students succeed. Trying to cater to a variety of learners is always a challenge. The teachers also took a weekend trip to Orinoco to plan workshops sharing teaching strategies and techniques, that were delivered on Monday. 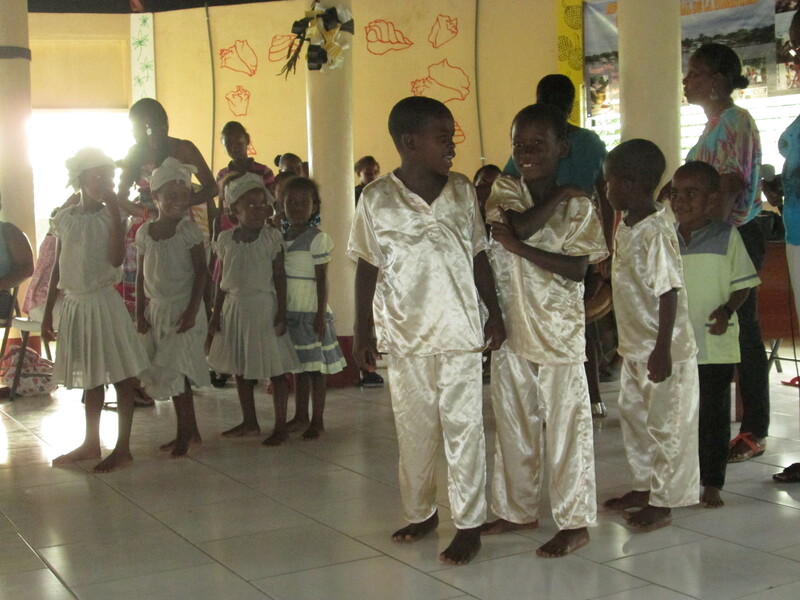 On Saturday there was a cultural show demonstrating the traditional Garifuna dance of the people of Orinoco. Children were showing the Canadian teachers how to dance and move their hips to the music! Five of us went to the Pearl Cays this past weekend to celebrate fellow intern Jay’s birthday. Despite the incessant rain that we’ve been having over the past week, it seems that the clouds parted and the sun came out just for us on Saturday morning. We were able to travel safely to the Cays and back and enjoy 24 hours of relaxation on our own private island. Our panga driver, Jimmy, kept us safe and well fed! 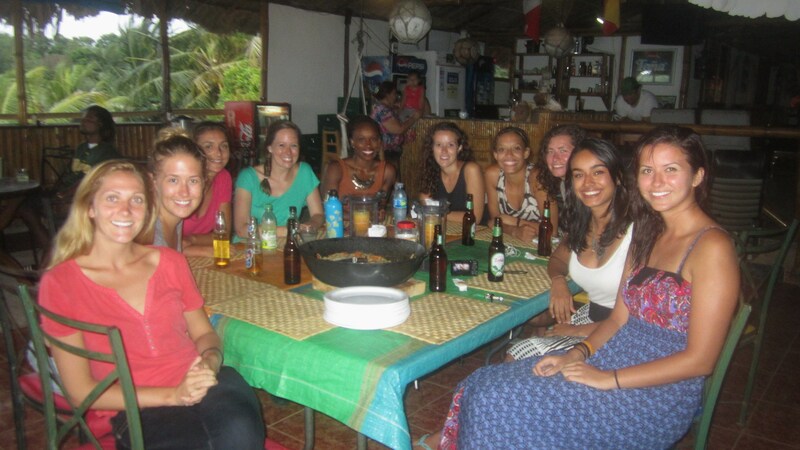 The foods included local dish Run Down (with fresh crabs, breadfruit and yucca) and coconut rice, gallo pinto and fried fish for dinner, then beans, tortillas and cheese for breakfast. Not to mention the fresh mangoes and coconut water we were able to indulge in while on the island. On Sunday all ten interns came together at Casa Ulrich for a birthday dinner for Jay, complete with homemade ice cream cake, donuts and a special hand-made card. Clearly the food has been a constant highlight during my stay in Pearl Lagoon thus far! As the Early Childhood Education intern I will be helping compile a teaching manual for preschool, kindergarten and possibly primary grades 1 and 2. In addition to helping facilitate a Children’s Rights workshop in 2 of the outer indigenous communities that are only accessible by panga. During the North-South Dialogue I had the opportunity to both observe and supply teach in preschool and kindergarten classes (known as Level 1 and Level 3 classes in Pearl Lagoon). In all of the classes children were full of energy and trying to stay on task after recess was definitely a challenge! One of my personal workplan objectives is to help develop a strategy for inclusive education with the Ministry of Education here in Pearl Lagoon (called MINED). The MINED has also expressed interest designating one teacher in each school to act as a guidance counsellor for children with behavioural challenges. Several parents are also interested in starting an afterschool homework club for children to get extra help and participate in fun learning activities. It feels like there are so many exciting projects to be a part of, but so little time to contribute to them all. It makes closing off this month both exciting and bittersweet. It feels great to know how far we’ve come, but weird to think we now have less than 5 months to go. We’ve finally settled into a routine, and have developed friendships with local people. The six of us also have a better handle on where things are in the community. We no longer get lost navigating the dirt and paved roads of Pearl Lagoon. Only time will tell how all of these plans become a reality. I’ve just been taking it one day at a time. Trying to enjoy and soak in every waking moment of the experience. ALISON! so great to get an update! It sounds like you’re doing amazing things. Keep on keeping on! Sending good energy and more sunshine your way.